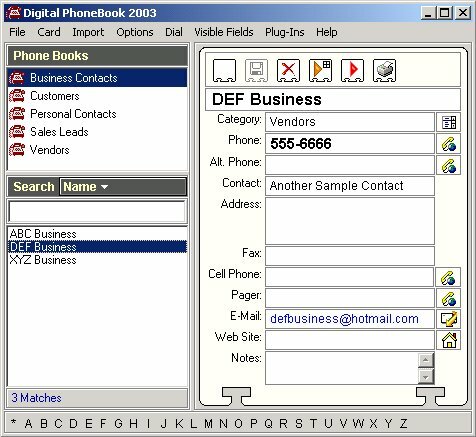 A very simple, fast, friendly contact management phone book software with printing ability, phone dialer integration, backup/restore features, moving/copying contact cards. Easy to understand screen layout. Perfect for sales leads, customer database, vendor database, business/personal contacts, and much more. Easy email and browser integration with the click of a button. Allows importing standard file formats including Outlook Express and Comma/Tab delimited files. Highly customizable viewing options for screen size, visible fields, font size (accessibility) and more. PlugIn ability to allow customized software to link into your databases. Options to add/remove icon from system tray/desktop/start menu. Simple interface to add new books, book links for networking databases. Easy to add/move/copy cards from one book to another. Allows printing a phone book. Allows you to show/hide which fields are visible to allow easy customization for your specific needs. This software is from over 6 years customer feedback to allow easy, fast, powerful phone book database management. Please give us your feedback on how we can make this software better to suit your needs. We appreciate your input.